[159 Pages Report] The global Enterprise Content Management market to grow from USD 31.66 billion in 2017 to USD 67.14 billion by 2022, at a Compound Annual Growth Rate (CAGR) of 16.2%. ECM solutions are gaining traction because of the increased need for effectively managing the voluminous content that is generated in organizations on a daily basis. These days, digitalization, Bring Your Own Device (BYOD), growth of eCommerce, and increase in the usage of social media have increased the amount of content generated in inter-organizations and intra-organizations. ECM solutions offer clients with the benefit of paper-free workflows, accurate searching of required information, and better information sharing, and also address the required industry regulations and standards. By doing so, ECM solutions help clients manage the essential enterprise information, and save cost and time incurred while searching the required data for making key business decisions. The base year considered for the study is 2016, and the forecast has been provided for the period between 2017 and 2022. There is an increased trend in the adoption of digital revolution across all verticals. Enterprises across all domains have been swept by a sudden surplus of exponential growth in data, over the last decade. Data is growing faster than ever before. Almost 90% of the world’s existing data has been created in the last few years, and by the end of 2020, it is estimated that the data would grow from 4.4 zettabytes to approximately 44 zettabytes. These factors have made it essential for enterprises to explore efficient database applications and implement scalable content management solutions. ECM captures, stores, manages, and delivers those unstructured data into a structured format without any error or data loss, and within seconds. To work more efficiently, traditional ECM solutions have evolved with new components, such as intelligent information platform, to capture and manage the new variety of data. There are various factors enabling enterprises to adopt ECM solutions, such as increasing business productivity and working efficiency, improving staff engagement, improving data control management, and minimizing the overall cost of data management. To describe and forecast Enterprise Content Management Market in terms of value, by component, deployment type, organization size, business function, vertical. The ECM ecosystem comprises service and solution providers such as Microsoft Corporation (US), IBM Corporation (US), Hyland Inc. (US), OpenText Corporation (US), Oracle Corporation (US), Laserfiche (US), Newgen Software (India), and M-Files (US). These Enterprise Content Management Software Vendors are rated and listed by us on the basis of product quality, reliability, and their business strategy. Please visit 360Quadrants to see the vendor listing of Enterprise Content Management Software. In February 2017, OpenText acquired the enterprise content division of Dell EMC. This acquisition has enhanced the entire length and breadth of product portfolio for content management along with the addition of huge customer base. In May 2016, Hyland launched its new platform, OnBase16, to help organizations to enhance, combine, and capture the capabilities of ECM, BPM, and case management throughout the information lifecycle. In February 2016, Alfresco partnered with Kainos Evolve, a leading UK-based provider of IT, consulting, and software solutions. This partnership provides data and content-management solutions to healthcare platforms. What are new business functions which the ECM vendors are exploring? 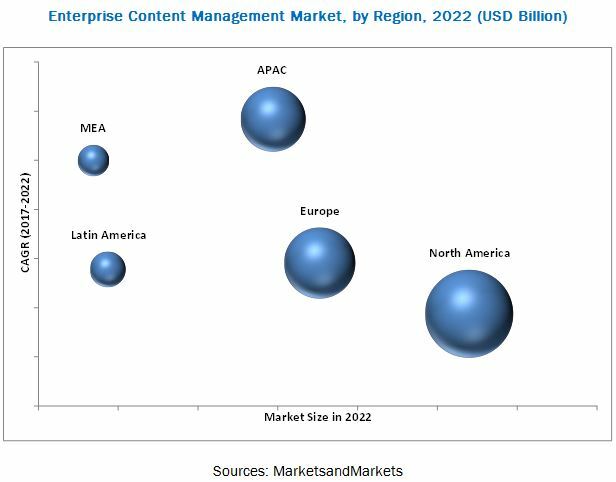 The Enterprise Content Management market is expected to grow from USD 31.66 billion in 2017 to USD 67.14 billion by 2022, at a Compound Annual Growth Rate (CAGR) of 16.2%. Several factors such as increasing need for regulatory content management and increased traction of risk mitigation are responsible for the growth of the ECM market. Verticals such as consumer and goods, government, healthcare and life sciences, manufacturing, IT and telecom, and transportation and logistics have contributed largely to the market. The market is segmented by component, deployment type, organization size, business function, vertical, and region. The cloud-based ECM deployment is likely to gain traction during the forecast period and grow at highest CAGR as it reduces the total cost of ownership by cutting down the cost associated with installing hardware to support ECM solutions. Cloud-based deployment model also offers higher agility than the on-premises deployment model. Enterprises are considering cloud deployment as solution providers offer remote ECM solutions at competitive pricings. ECM solutions are estimated to dominate the Enterprise Content Management market in 2017, while ECM services are expected to witness the fastest growth during the forecast period. ECM solutions are gaining popularity as an enormous amount of data being generated by organizations and the need to safeguard a large amount of enterprise data from a centralized place. However, ECM are vital to ensure proper implementation, maintenance, and support of ECM solutions. Leading ECM solutions enable line of business departments to manage user access independently, which means sensitive HR information stays within the HR department, while private financial information stays within the finance department, even if the information is stored in the same repository. The Small and Medium-sized Enterprises (SMEs) segment is expected to grow at the highest CAGR in the market during the forecast period. SMEs have various personal data related to customers, which is required to be protected from being affected by the vulnerabilities. Increasing awareness and digital transformation has influenced SMEs to adopt cloud-based ECM solutions. By business function, the supply chain management segment is expected to have the largest market size during the forecast period than the other segments. The supply chain department deals with inventory optimization integrated with global customer requirements. ECM helps all upstream customers and downstream suppliers’ records to be integrated into one easy interface. Furthermore, ECM provides additional security for files in terms of document sensitivity and user access levels. ECM solutions and services are being increasingly adopted by verticals, such as transportation and logistics, healthcare and life sciences, consumer goods and retail, manufacturing, and energy and utilities, to automate and protect the valuable data, thus, fueling the growth of the ECM market across the globe. The consumer goods and retail vertical is expected to hold the largest market size during the forecast period. However, transportation and logistics segment are also expected to represent prospective opportunities during the forecast period for ECM vendors. 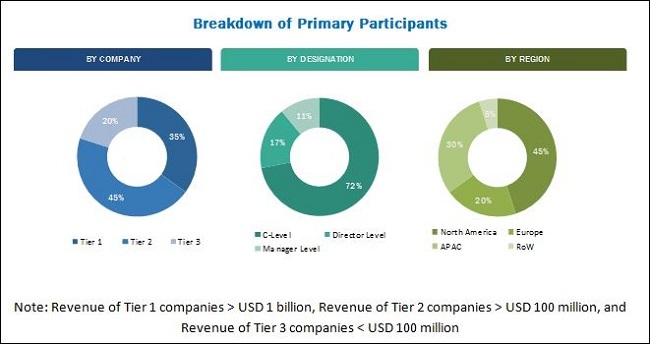 The Enterprise Content Management market has been segmented by region into North America, Europe, Asia Pacific (APAC), Middle East and Africa (MEA), and Latin America to provide a region-specific analysis in the report. North America is expected to have the largest market size and is expected to dominate the market from 2017 to 2022, considering the presence of large ECM vendors in the region. The region is also considered to be one of the most advanced regions with regards to the technology adoption and infrastructure. The consumer goods and retail sector is quickly adopting ECM technologies, which support business continuity and enhance the level of competitiveness. With the help of content management systems, most of the retail enterprises are planning to merge their legacy product information management systems with their inventory management systems. Content management systems are vital and required to support B2B trading and manage eCommerce data. Content management by eCommerce companies can be really instrumental in enhancing their competitiveness and reducing the total cost of ownership. Retail ECM can help to simplify the different strategic goals of retailers, such as customer retention, product information lifecycle management, and brand management to maximize efficiency. Transportation and logistics organizations need ways to collect, manage, and analyze tremendous volume, variability, velocity, and precision of data, making data consistency in content important. Consistent content can be useful in enhancing the productivity and efficiency of transportation enterprises. Content management in the transportation sector can be instrumental in introducing a visibility and control mechanism by clubbing the national transport policy, national transport strategy, and transport master plan together for better governance. Healthcare facilities are complex organizations, consisting of doctors, patients, staffs, administrators, and public, and the content they generate is usually private and highly confidential. ECM systems help health information management departments to reduce document management load by storing online patient data and documents and ensuring secure transaction and processes from one user to another. Alfresco, Streamline Health, EMC, HP Autonomy, Hyland Software, IBM, and Microsoft are some of the healthcare and life sciences ECM solution providers of today. What are the upcoming industry applications for ECM? Difficulties in smooth handling of enterprise data in case of merger and acquisition, the existence of functional content data silos about ECM among enterprises across various industry verticals is restraining the growth of ECM market globally. This is one of the major identified restraints affecting the widespread adoption of ECM in the global market along with the challenge of aligning ECM strategy with the organizational strategic initiatives. 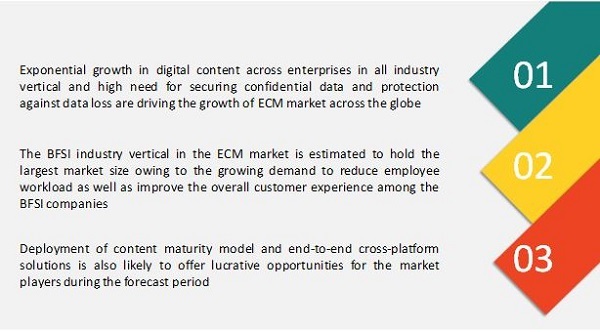 The massive growth in the amount of data with the deployment of Content Maturity Model is expected to provide great opportunities to the ECM solution vendors to grow in the future. The major vendors that offer ECM solutions and services across the globe are Microsoft Corporation (US), IBM Corporation (US), Hyland Software, Inc. (US), OpenText Corporation (US), Oracle Corporation (US), Alfresco Software, Inc. (UK), Everteam (France), Fabasoft (Austria), M-Files Corporation (US), Laserfiche (US), Xerox Corporation (US), Newgen Software Technologies Ltd. (India). These vendors have adopted different types of organic and inorganic growth strategies, such as new product launches, partnerships and collaborations, and mergers and acquisitions to expand their offerings in the Enterprise Content Management market.